Three of the greatest comedies of all time, Charlie Chaplin’s The Kid (1921), Buster Keaton’s Cops (1922), and Harold Lloyd’s Safety Last! (1923), were each filmed at a small Hollywood alley you can still visit today. Running east-west between Cahuenga and Cosmo just south of Hollywood Boulevard, the unnamed alley was conveniently located to the studios, providing a secluded spot to shoot. Each film has been inducted into the National Film Registry of the Library of Congress as a work of enduring importance to American culture. Looking south, Charlie Chaplin in The Kid. 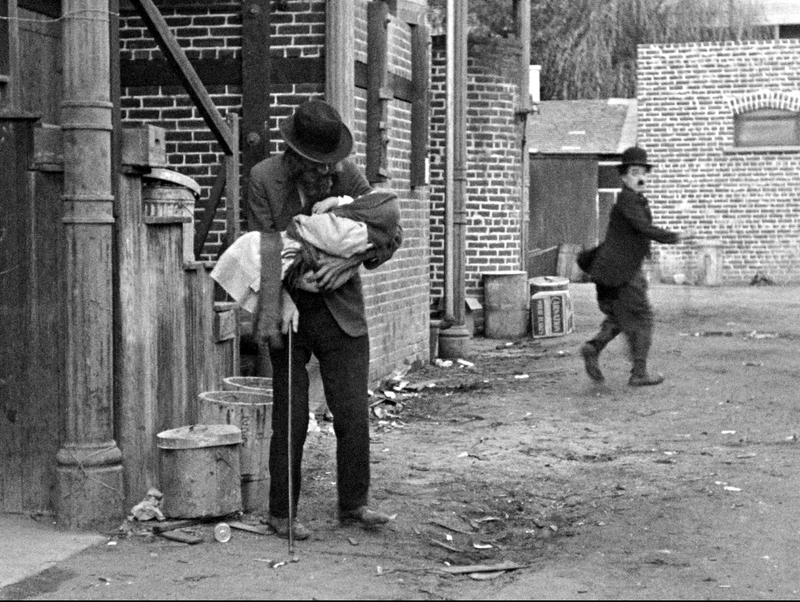 It was here Charlie’s Little Tramp discovers the abandoned infant he will raise as his son (portrayed as a child by Jackie Coogan) during the opening scenes from The Kid. This main view looks south, where a patio dining area blocks some of the view today. A reverse view (right) shows Charlie running north towards the same spot. As posted HERE, Charlie and Jackie Coogan reunite emotionally later in the film at Olvera Street downtown. Looking east from Cahuenga, Buster Keaton in Cops. 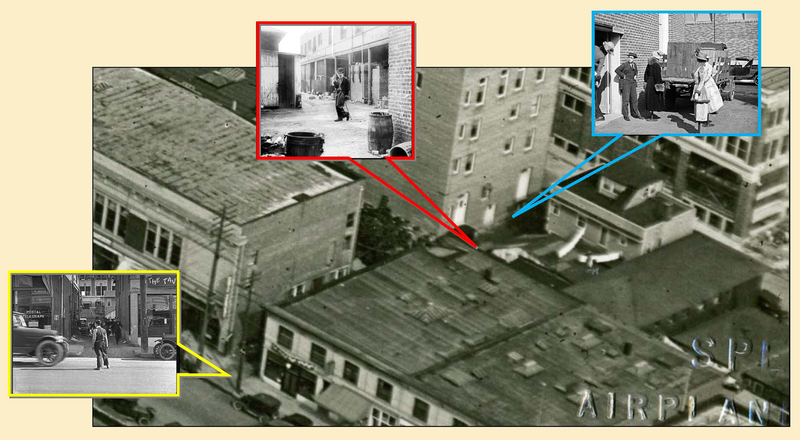 The west end of the alley on Cahuenga appears in Keaton’s most famous short film Cops. 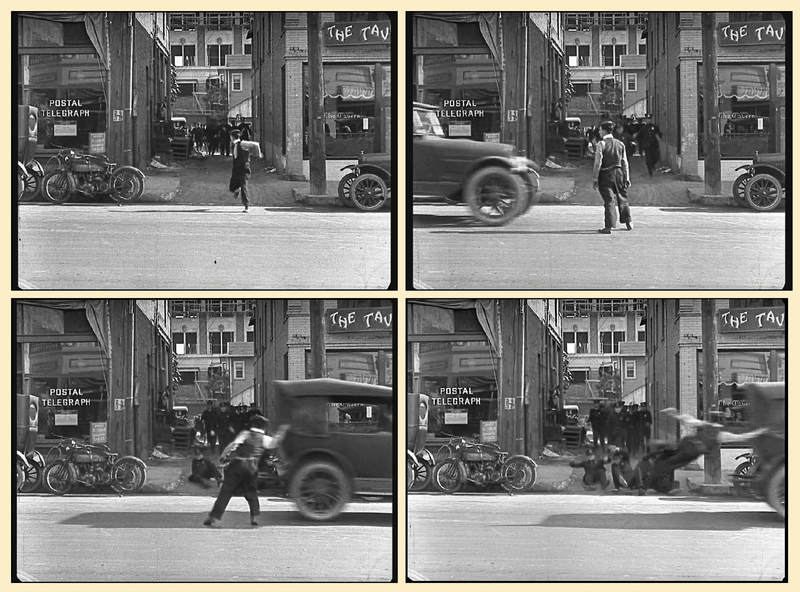 Chased by a mob of angry police, Buster stops in the street and grabs a passing car one-handed that whisks him out of frame to safety (left – click to enlarge). At back appears the extant Palmer Building on Cosmo, still under construction at the time, that would become the future home of the now defunct Hollywood Citizen newspaper. The art deco building on Cahuenga now standing to the left of the alley was completed in 1935 (designed by noted LA architects Morgan, Walls & Clements), making the alley slightly more narrow today. Looking east towards Cosmo, Harold Lloyd in Safety Last! 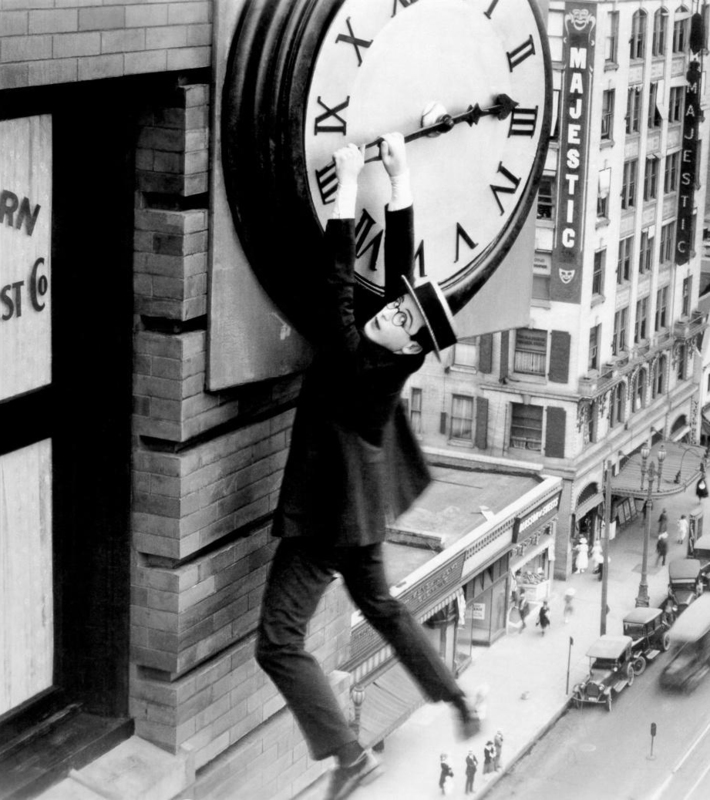 Lloyd is best remembered for hanging from a skyscraper clock in the stunt climbing thrill comedy Safety Last! Harold plays a department store salesman in this film, shown above calculating how to sneak in late to work. The east end of the alley portrayed the back of Harold’s store, where Lloyd filmed many scenes, with the Palmer Building on Cosmo forming a backdrop. 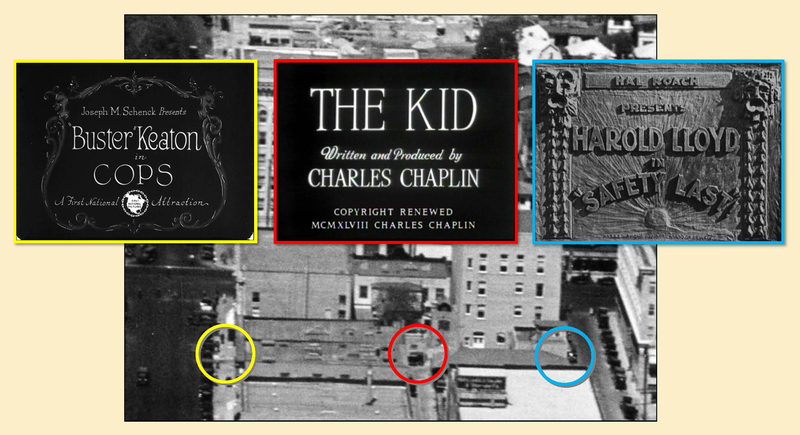 You can read more details about Chaplin, Keaton, and Lloyd filming at the alley HERE, how pioneering female director Lois Weber filmed Where Are My Children here in 1916, before all the men did HERE, how the alley appears in Harry Houdini’s 1919 feature The Grim Game HERE, how the site appears in the 1994 Johnny Depp/Tim Burton movie Ed Wood HERE, and how it appears in the newly discovered closing shot from Keaton’s 1922 short My Wife’s Relations HERE. Another alley appearance, Buster in My Wife’s Relations. Cops (1922) licensed by Douris UK, Ltd. HAROLD LLOYD images and the names of Mr. Lloyd’s films are all trademarks and/or service marks of Harold Lloyd Entertainment Inc. Images and movie frame images reproduced courtesy of The Harold Lloyd Trust and Harold Lloyd Entertainment Inc.
Hollywood map detail © 1938 Thomas Bros. – David Rumsey Map Collection. Aerial photos courtesy HollywoodPhotographs.com and Marc Wanamaker – Bison Archives. 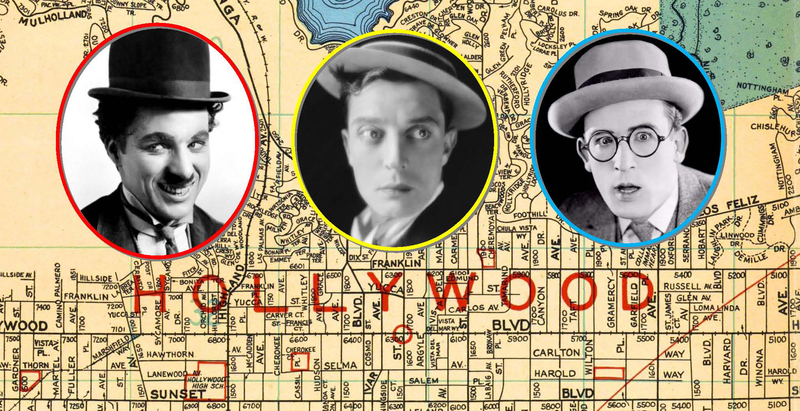 This link provides a comprehensive PDF tour of Cahuenga, where more silent movies were filmed by more stars than at any other spot in town. Hollywood’s Silent Echoes Cahuenga Tour 2018. 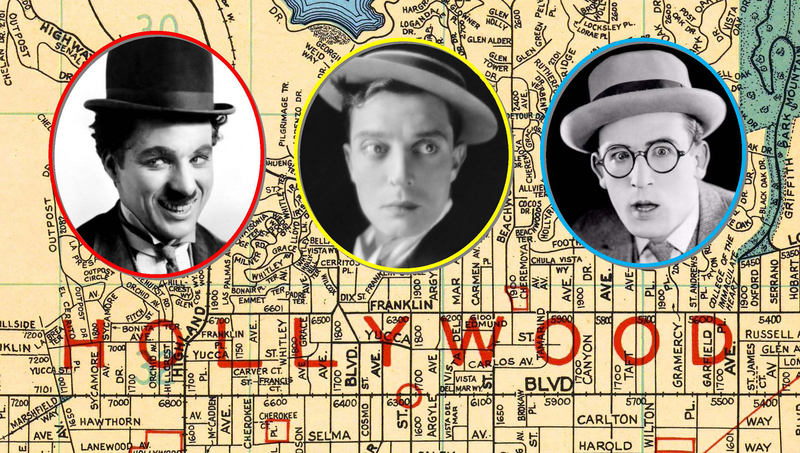 This link provides a comprehensive PDF tour of over 50 silent movie locations across Hollywood. Hollywood’s Silent Echoes Tour – Cinecon 2016 – John Bengtson. This entry was posted in Buster Keaton, Chaplin - Keaton - Lloyd Alley, Charlie Chaplin, Cops, Harold Lloyd, Hollywood Tour, Safety Last!, The Kid and tagged Buster Keaton, Cahuenga, Chaplin - Keaton - Lloyd Alley, Charlie Chaplin, Cops, Cosmo, East Cahuenga Alley, Harold Lloyd, Hollywood, Safety Last!, Silent Comedians, Silent Comedies, Silent Movie Locations, Silent Movies, The Kid, then and now. Bookmark the permalink. John, I managed to visit Cahuenga St. and the legendary alley where Keaton, Chaplin and Lloyd shot their masterpieces in February. Your blog and the tour guide was a great help!! Without your research I couldn’t have such wonderful experience. Thank you!! I’ll be speaking about my trip next month at Kobe Film Archive and would like to introduce your blog to Japanese audience. I hope you wouldn’t mind my doing so. With sincere respect and appreciation.